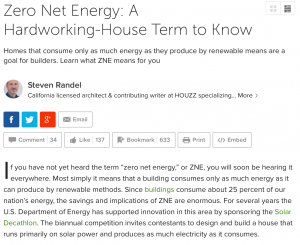 If you have not yet heard the term “zero net energy,” or ZNE, you will soon be hearing it everywhere. Most simply it means that a building consumes only as much energy as it can produce by renewable methods. Since buildings consume about 25 percent of our nation’s energy, the savings and implications of ZNE are enormous. For several years the U.S. Department of Energy has supported innovation in this area by sponsoring the Solar Decathlon. The biannual competition invites contestants to design and build a house that runs primarily on solar power and produces as much electricity as it consumes.